I do love a bit of urban decay - I've always envied those intrepid folk who somehow manage to get into disused London underground stations, sewers and grand buildings, to explore what has been left behind to rot. There's something incredibly evocative about walking in place that has been left untouched for years and years - for me, it's as near as can be got to actually walking in history. I could spend hours just seeing what's been left, and wondering who last touched an object, or walked in my exact footsteps. Out here in the Wiltshire countryside, where I live, such experiences are hard to come by. Besides the odd derelict barn (and most of these have now been converted into homes), there isn't much to trespass into - I mean, explore - besides, of course, the timeless gorgeousness of the landscape itself. 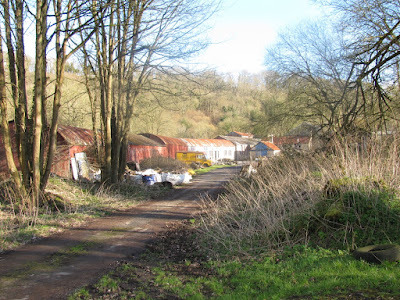 So imagine my joy when the research of my latest novel led to me discover some wonderful domestic and industrial archeology, right on my doorstep. My novel is set in the By Brook Valley, about ten miles from where I live. The By Brook Valley, which also featured briefly in an earlier novel of mine, The Misbegotten, is one of my favourite places in the UK. 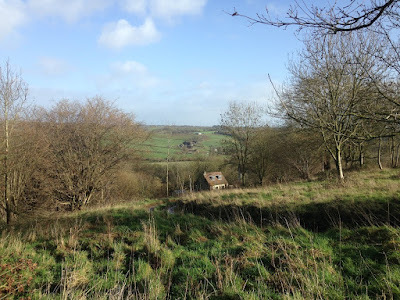 A steep, rolling green valley, with the winding By Brook at its heart, it has small villages and isolated farmhouses all built in local Corsham stone; it's a piece of rural England from a bygone era, even if it now has the M4 to the north, and Bath and Bristol to the west. 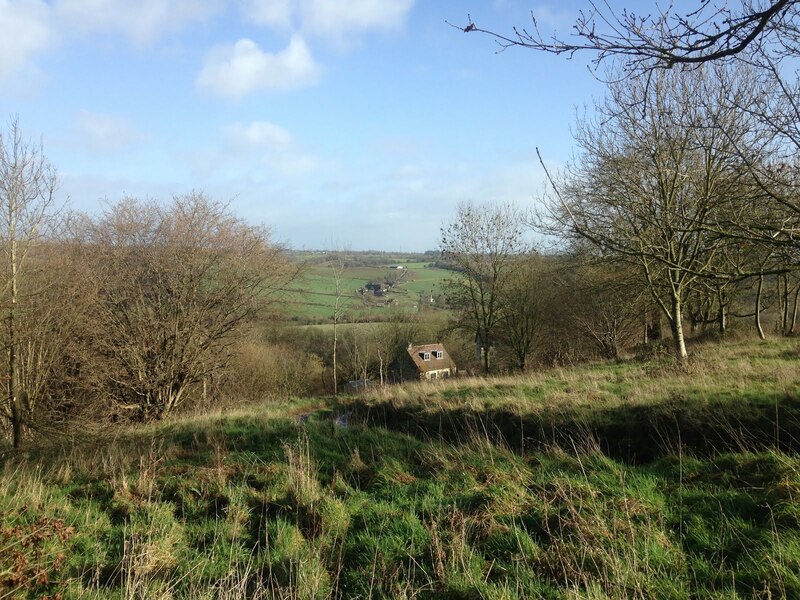 A view of the By Brook Valley from Colerne Down, on high ground to the west. Taken back in February. In the far distance is Manor Farm, Slaughterford. 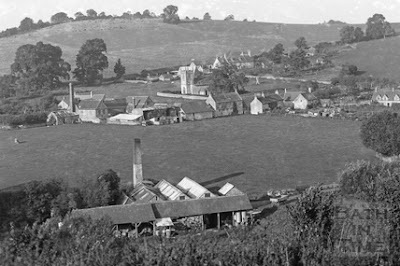 Slaughterford in about 1932, with Rag Mill in the foreground (the river is hidden by the trees), Little & Sons Brewery middle left and Manor Farm top right, with St Michael's church and the cottages winding down the lane between the three. and a paper mill, Chapp's Mill. 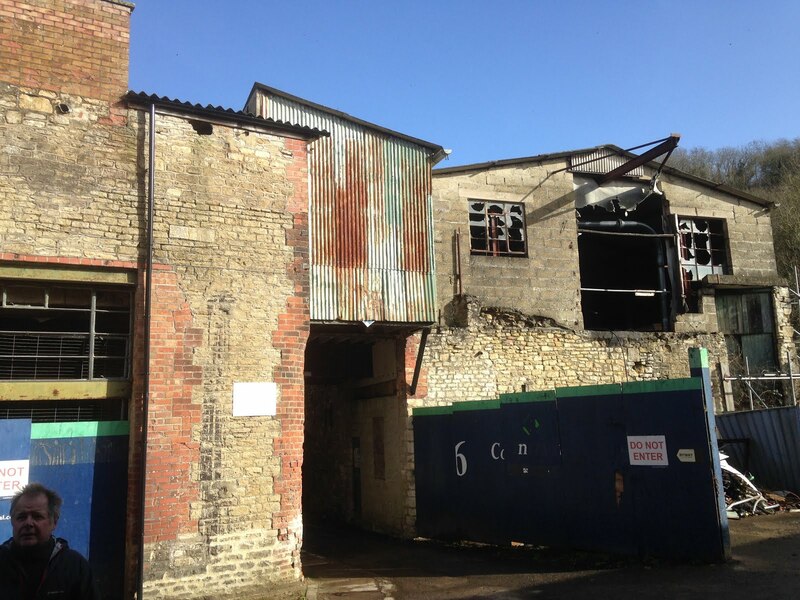 Chapp's Mill remained in business longer than any other By Brook mill, and was still making paper bags, and tough brown paper for grocery wrappings etc into the 1960s, employing around 100 men on two shifts so that the mill could run twenty-four hours a day. 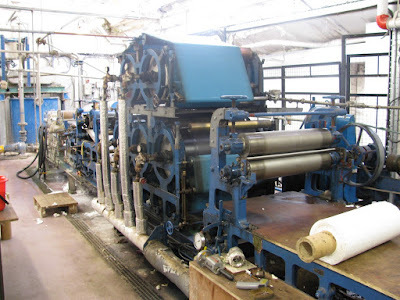 By that time the water wheel had been replaced by two turbines, and the mill was run by electricity generated on site; but the 78" Fourdrinier paper-making machine, installed there in the late nineteenth century, was still running. 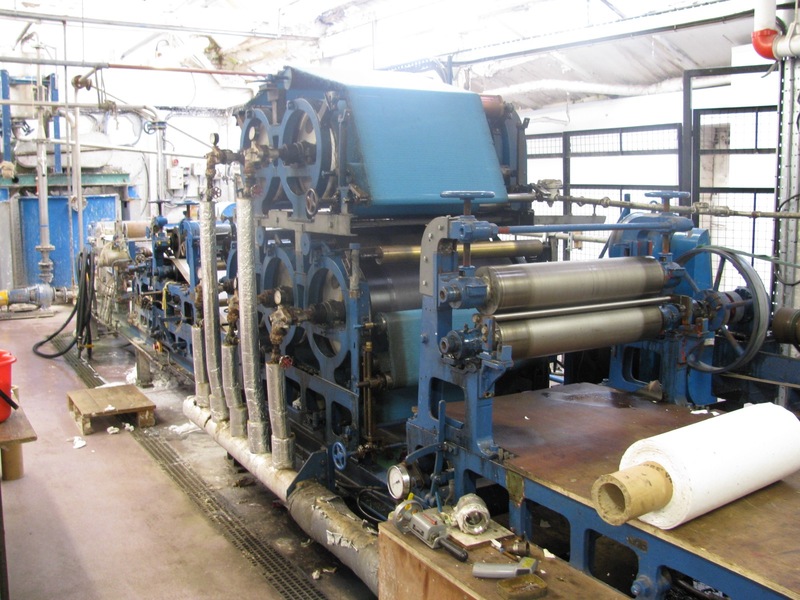 It's still running today, in fact - when Chapp's Mill closed, put out of business by the development of plastic wrappings, it was dismantled and shipped to South Africa, where it's still in use. Back then, things really were built to last! The 'dry end' of a working Fourdrinier machine at Frogmore Mill in Hertfordshire. This is much smaller than the one Chapps' Mill had, which would have been around thirty meters long. 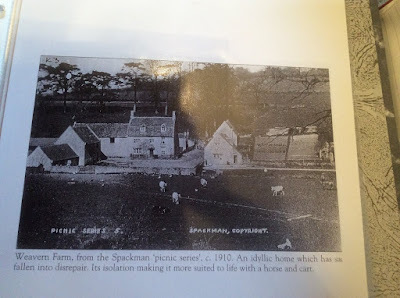 A not very good photo of a photo of a photo, showing Weavern Farm in 1910, before it was abandoned. Slaughterford is rumoured to have got its name after a bloody battle during which King Alfred defeated an invading Danish army. 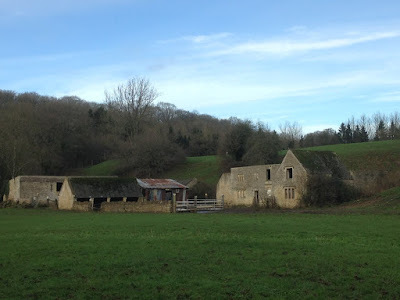 Opposite Chapp's Mill is a field still know as 'Bloody Meadow', even though archeologists now think the battle might have been at Edington, to the south. Slaughterford's church, St Michael's, was ransacked by Cromwell's troops in the early 1650s, who passed through on their way to Ireland to do even worse things. It sat derelict for centuries until it was restored in the nineteenth century. Until then, villagers were forced to walk to nearby Biddestone to worship, where they were sniffed at by the Biddestonians, and made to sit all together in a separate section. There was also a Friend's Meeting House, hidden in the trees on the steep hillside above Slaughterford. Manor Farm has a huge medieval tithe barn, which nobody quite knows the origins of. 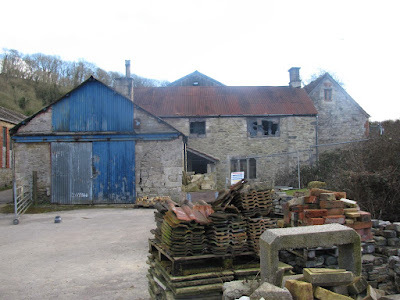 I wonder if it might date back to the 1100s, when King Stephen granted the manor and its mills to the Cluniac priory in Monkton Farleigh, to the south. Chapp's Farmhouse. This was the house of the original farm attached to Chapp's Mill, which was absorbed into the mill as it grew. For most of the twentieth century, it was used as the mill's offices. It is now being steadily restored by the new owners, and will soon be lived in again for the first time in over a century. Layers of growth, new on top of old - the many different phases of building throughout the years are easily visible at Chapp's Mill. 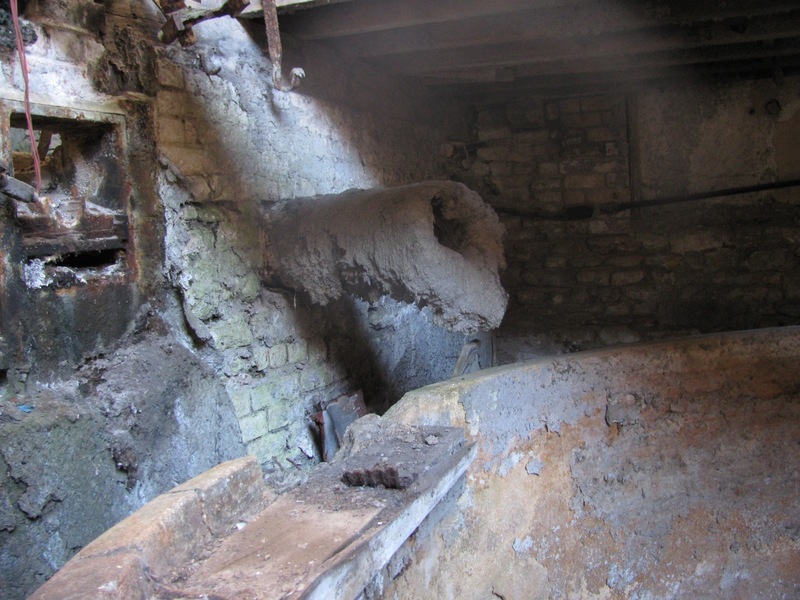 Here's the beating house, where old paper, and the pulped rags from Rag Mill, would be pounded into fine pulp for paper making. The winch was used to hoist in huge bales of scrap paper. 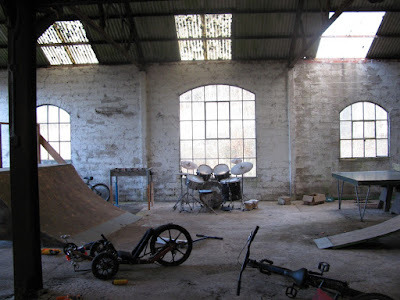 Inside the old machine house, where the Fourdrinier machine would once have been. The mill stream runs directly underneath this building, and at its southern end it originally turned a sunken 'overshot' mill wheel, first wooden, then iron, then replaced in the early years of the twentieth century with two water turbines, which are still down there, in their pits, too heavy to lift out... They, too, fell out of use as the mill was increasingly run by steam and electricity. 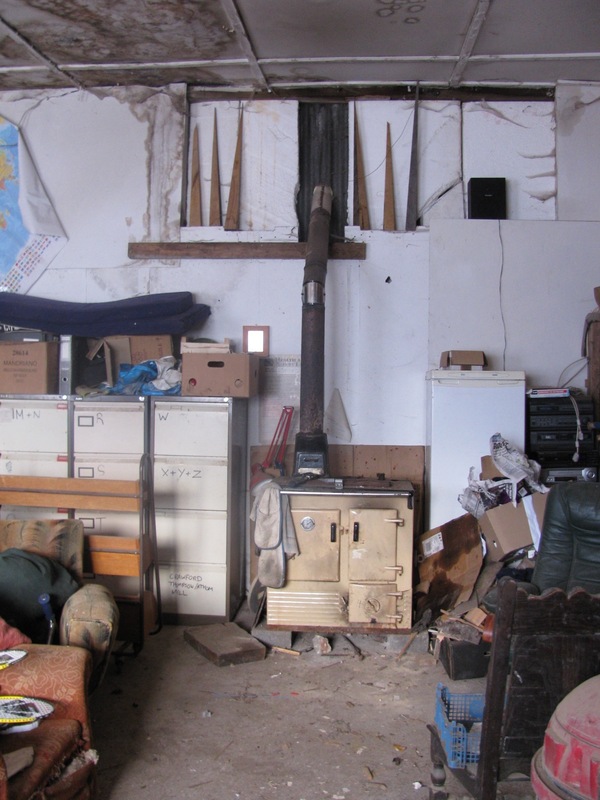 The old stove which would have warmed the Bag Room - this room was where the paper was stitched and glued into tough paper bags for sugar etc. The room would have been immaculately clean, with an elm floor and polished walnut benches, since no dirt or grease could be allowed to mark the paper. 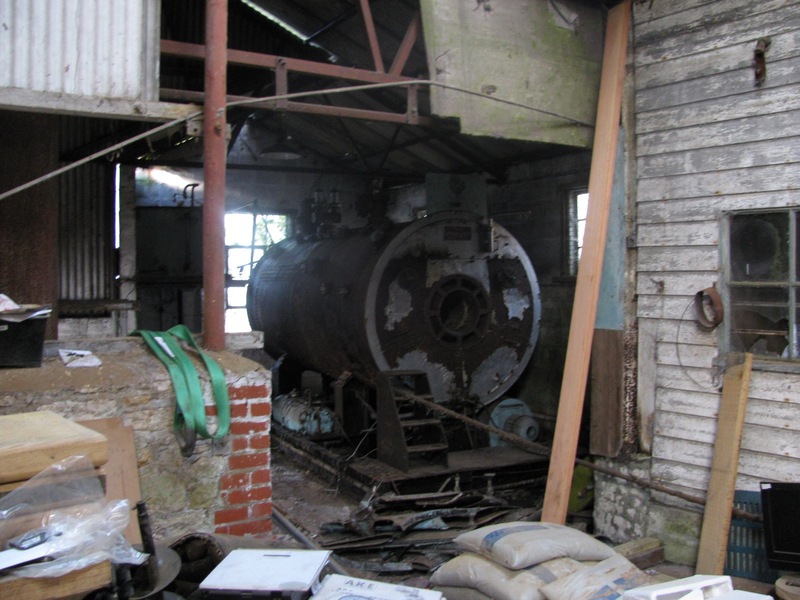 One of the old boilers, which would have generated steam to run the various machines. This one would likely have driven the several beaters. Paper pulp still encrusted around the pipe that fed the 'stuff', as it was called, from the beater tanks into the stuff tank, ready to be diluted and refined, and ultimately fed into the Fourdrinier machine. Dr kuratu is a very genuine spell caster and a very unique and a powerful man of wisdom. i am a lottery winner, but before i i started winning , i had some very bad experience in playing the lottery, because my life was at stake, then lottery seemed to be the only means that came into my head, i played the lottery steadily over 3 years , but i could not win more than $500, but i always see people winning millions of dollars, so with that i extended my search for victory , then i found Dr.kuratu a powerful voodoo Dr kuratu who promised to help me win the lottery.i contacted Dr.kuratu and he did his normal work for me and finally i won the lottery,$25.000000.00.This spell changed my life into riches. I am now out of debts and experiencing the most amazing good luck with lottery after i won that huge amount of money. I have more luck now than I ever had in my life..you can contact him for you own lottery number. contact Dr kuratu via email:kuratuspelltemple@gmail.com.